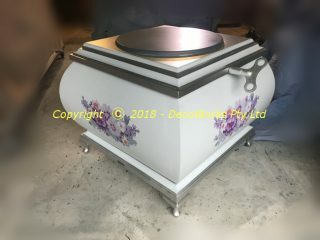 This giant sized music box was built for a client who wanted an adult ballet dancer to perform a short routine for an event. 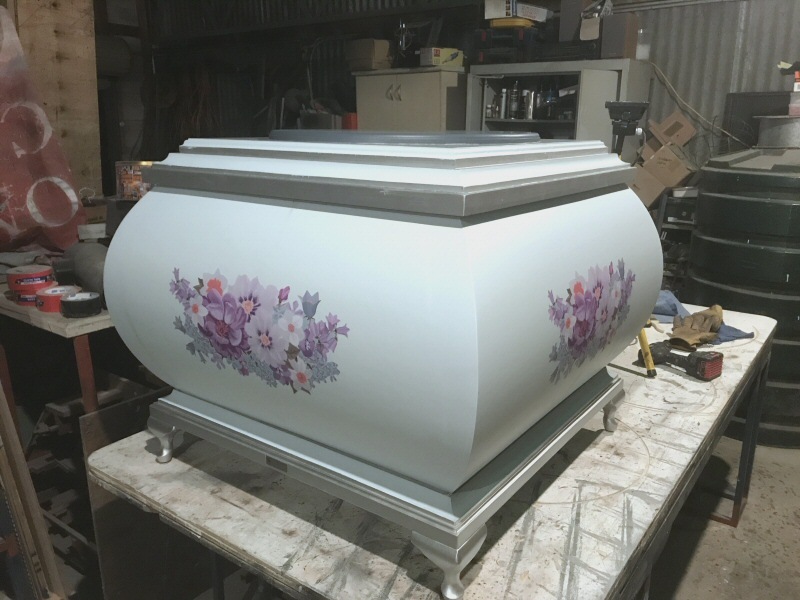 An old fashioned look was required so a convex sided box with timber trim top and bottom was decided upon with floral decals on the side. A giant sized silver key was also built that fitted into the top of the music box to give the illusion of being able to “wind it up”. The most complex part of the giant sized music box build was constructing the convex middle section. 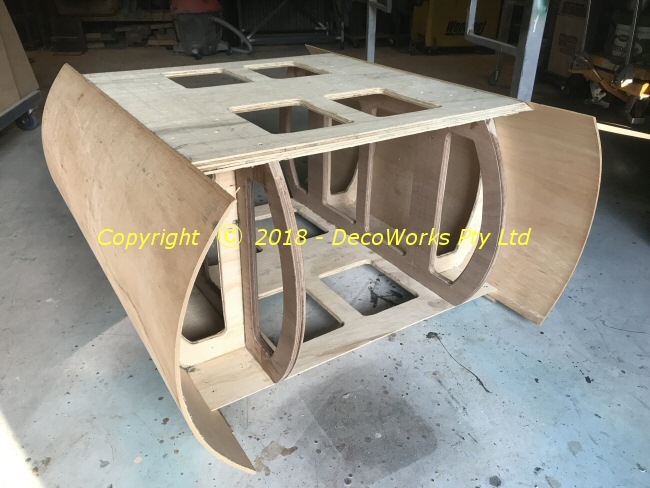 A timber skeleton was built with curved inner support panels on which bendy ply could be attached. After the first two opposite sides were attached the curve of the remaining sides were carefully traced using the exposed inner panels as a guide. 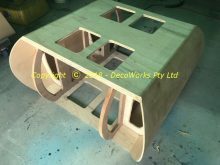 The sides were then trimmed to almost the line and then sanded to the final shape by hand. 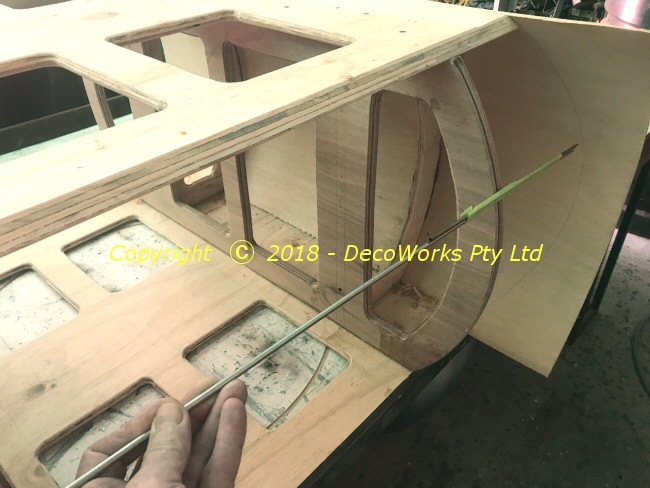 This was accomplished by glueing sandpaper around a length of 30mm tube which was then drawn back and forth following the curve of the inner panels. 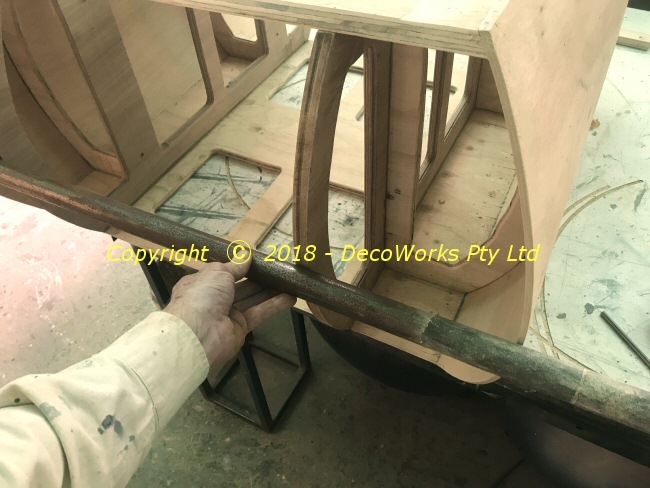 It was important to get the outer curve of the sides to match exactly the inner support panel curve so that the bendy ply would contact all four surfaces when folded over them. This ensured a neat join of the side panels once they were sanded back. Once the music box middle panels had been sanded to match the curve of the sides the remaining two sides were attached. Liquid nails was used along all internal faces and the edges of the first two side panels. Once attached the adhesive was spread evenly along the inside join of the sides to ensure a good bond. The weight reducing holes in the inner framework facilitated access to these areas. 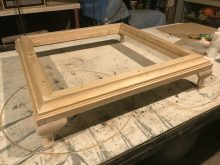 Next the music box base and top were built. These were quite straightforward to build and the top used 30mm thick pine that would support the dancer. Timber mouldings were cut to make the music box look more interesting and small cabriole legs were purchased to add that bit of old fashioned charm. The music box parts were then undercoated and painted. 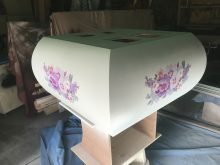 Floral decals printed on stick-on vinyl were attached to the middle section after the final painting had been done. A final over spray of matt clear polyurethane blended the decal and the topcoat of the music box and also added a bit more adhesion for the decals around their edges. 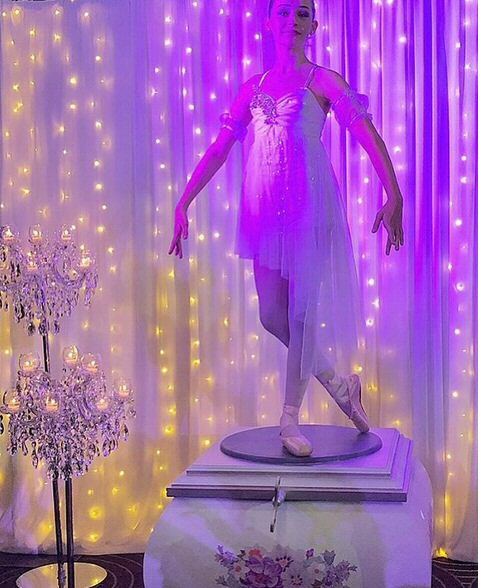 This entry was posted in Projects and tagged dance, display, props. Bookmark the permalink. I have my dance concert next Saturday the 24th Nov at Riverside Theatre parrammatta. We are doing Anastasia and I needed a music box that one of my dancers could stand on. Do you hire this prop? Do you deliver and what are the hire fees please? The music box was built for a client in Sydney. 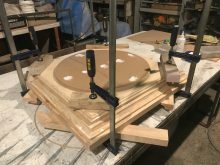 It is 770mm high with a 570mm circular platform on top for the dancer. It is square with maximum width/depth of 940mm. It is a two person lift. I have contacted the client to see if she will hire it out and am waiting for her response before I email you her contact details.